Around 30 tenants and staff got together at Halliwell UCAN centre on Tuesday for our latest Tenants’ Forum. 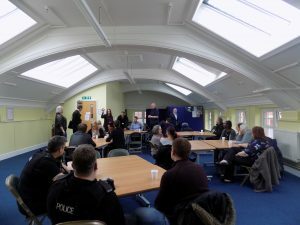 The event kicked off with a talk from Shaheena Sameja, manager of the UCAN centre, who told residents that they should treat the UCAN centre as a place to go with any problem or just to visit and make use of the variety of services on offer. Next we heard from Penny and Alison from the DWP, who offered advice on benefits and the upcoming roll-out of Universal Credit in Bolton in November. They also answered questions from tenants concerned about the changes. Operations Director Pete Lynch then gave us an update on how far My Space has come, and made sure all tenants know we need to hear what we’re doing wrong as well as what we’re getting right. After lunch and a quiz, Maintenance Operative Damien McLaughlin let everyone know that he and his team are there to help – it’s their ambition see all our tenants succeed in their tenancies. We also heard from tenant Phil, who has secured a job as a Project Worker for people with learning disabilities, and who is getting ready to move on to a tenancy of his own. Winners of our competitions on the day were Nicky and Stephen who won the ‘Chocolates and Sweets’ quiz and Angie Grady who won ‘Guess the Number of Sweets’! Thanks to everyone who came along – see you next time!